Nick Pitts, our Director of Music, was awarded the British Empire Medal in the Queen’s Birthday Honours in June 2012. He was nominated for his services to the community as choir master for more than thirty years. He was presented with his award by the Lord Lieutenant of Lincolnshire at the Parish Eucharist on 25 September 2012. 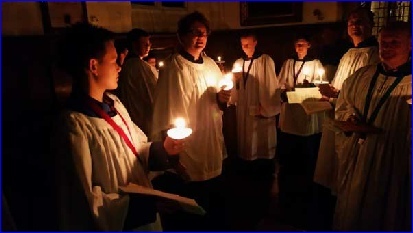 Weekly choir practices for boys are on Wednesdays 4.30-5.30pm and Fridays 7.00-8.15pm, and for men are on Fridays 7.30pm-8.15pm. There is also a supervised Choir Club for the boys which meets on Wednesdays at 4.30pm (before choir practice) and also between 5.30pm and 6.30pm. During school holidays the choir master Nick Pitts organise trips and outings.